Alrighty fellow book nerds. I love apocalyptic books as much as I love sci-fi, fantasy, and supernatural reads. This particular book has been a doozy for me to read. It’s not a difficult read, per se. Some of it is just downright scary. Seriously. Remember that ebola scare awhile back here in the states? The media was freaking out that we’d have a full blown epidemic? Well, although that turned out to not be quite as bad as some had feared, in ‘Extinction Horizon’ it’s a whole new ballgame. 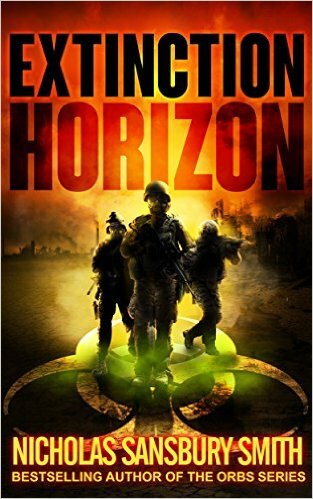 ‘Extinction Horizon’ takes a semi-twist on “zombie apocalypse” storytelling, in that the zombies are actually people who have been infected with a supervirus. Unfortunately, it also spreads faster than wildfire. Although I’ve seen some zombie-esque stories that involve infected humans (i.e. the ‘Left 4 Dead’ video game), I’ve never seen one quite like this. I don’t want to give too much away, since it’s definitely worth reading, so I’ll just leave it at that. 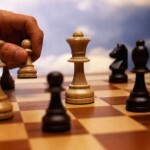 The narrative switches between main characters in the story, chiefly that of Master Sergeant Reed Beckham (leader of Delta Force Team or “Ghost”) and Dr. Kate Lovato (one of the top virologists working with the CDC). The author, Nicholas Sansbury Smith, does a very good job of keeping the tone for each of them separate, without taking away from the overall narrative. He also does a splendid job of detailing the setting so you can see it in your mind, without getting too carried away and droning on and on for pages about particulars. The characters are very likable, for the short time that you’re able to connect with some of them. Furthermore, although the author does jump around to different settings and times, he keeps it very cohesive so you don’t get too confused on what’s going on at any given moment. 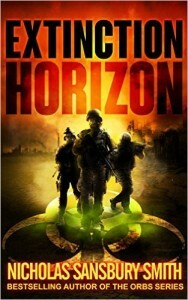 ‘Extinction Horizon’ is the first book in the “Extinction Cycle” series. If you like books with zombies, government conspiracies, and hardened military guys, you’ll definitely want to start this series up. You can find it anywhere fine books are sold, or you can get a copy for your Kindle at Amazon here. If you have read the book, are currently reading it, or plan on picking it up, comment below with your thoughts. Have a suggestion for next month’s read? Comment below!